The ruling coalition will face the grand alliance led by the Rashtriya Janata Dal in the upcoming electoral contest. Amit Shah said Bihar has developed by leaps and bounds under Chief Minister Nitish Kumar. 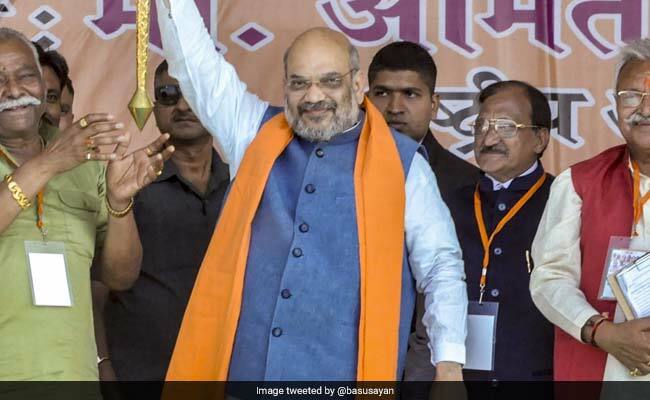 Years after Prime Minister Narendra Modi brought up the issue of electricity to target the grand alliance in the 2015 Bihar assembly elections, BJP president Amit Shah on Friday raised the same topic in a rally at Bihar's Aurangabad to drum up support for the National Democratic Alliance ahead of the Lok Sabha polls. His approach, however, was a little different. Four years ago, PM Modi accused Chief Minister Nitish Kumar -- then a political opponent -- of not fulfilling his electoral promise of providing electricity to every corner of Bihar despite being in power for five years. "Bijli Aayi? Bijli Aayi?" he would ask the public animatedly. His question wasn't a big hit with voters, and the BJP suffered a setback in the state. Times have changed, bringing the BJP and the Janata Dal (United) together after Nitish Kumar's controversial switch in 2017. And Mr Shah's claim on Nitish Kumar's achievements on the electricity front has also changed considerably. "Do you remember the days of Lalu Yadav, when there was darkness and corruption all round?" he asked a crowd of BJP supporters in Aurangabad on Friday. "But now, under the leadership of Nitish Kumar, all households have been electrified." Everything from roads to infrastructure has also improved under the BJP's coalition with the Janata Dal (United), he added. Janata Dal (United) leaders said Mr Shah's speech was a well-deserved acknowledgment of Nitish Kumar's achievements in the state. Bihar was among the few states in the country that managed to achieve the electrification target before the national deadline of December 31 last year. The ruling coalition will face the grand alliance led by the Rashtriya Janata Dal in the upcoming electoral contest. Bihar - which has 40 Lok Sabha seats - will vote in all seven phases of the national election to be held between April 11 and May 19. The results will be announced on May 23.